South Africa is the ideal destination for adventurous trips and sport in natural surroundings. A motorbike holiday in this corner of the planet can be really tailored to your needs and desires. If you decide on an ‘asphalt trip’, starting from Johannesburg towards the parks or from Cape Town to follow the coastline, the support of a local guide is fundamental. Most of the roads are in perfect condition… but do not be fooled by the absence of traffic, which invites opening the throttle: the local population crosses the road without looking and small buses with crazy drivers stop continuously to let passengers on and off. After sundown visibility, especially in rural areas, decreases a lot, to which you must add pitch black nights and the possibility of meeting animals on your way. So do not go fast and do not let yourselves get too distracted by the natural beauties that reveal themselves behind every curve. In case you are interested in a ‘raid’ style trip be aware that on off-roads sandy areas which can reach a depth of 15/20cm are very common. If you are not experts you need to be very careful. Ride with your weight at the back of the saddle and do not slow down, on order to prevent the front axle from digging into the sand (with consequent fall). In most cases if you go at around 50kmh on sand you will not have any problems. 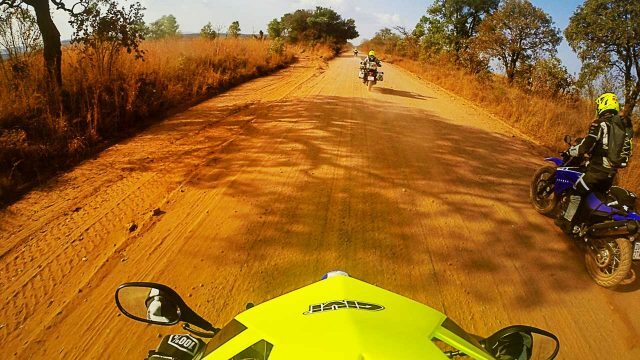 The advice, if you are aiming at an off-road trip, is to rely on a local motorbike guide, who knows the territory well and can solve any possible problems. In South Africa you drive on the left. Fundamental are wide-capacity rigid cases. Adding internal bags makes transporting luggage during breaks easier (avoiding having to take all the cases). According to the type of itinerary, extra water or fuel tanks could be useful, along with all the technical accessories to protect the engine from rocks and blows, such as engine guards and carter protectors. South Africa has inverted seasons, but temperatures, also in winter (our summer), remain mild, with the exception of the mountainous regions of the Country. In these cases a windscreen becomes useful. In case of local bike hire, after having checked the proposed equipment, consider taking a couple of soft bags and a high-visibility vest. It is always advisable to use your own helmet. In the case of a tour without a local guide, it is essential to have with you a First aid kit, tyre repair kit, smart accessories such as satnav support, cables to recharge electronic devices… Be careful when choosing clothing: during the South African winter, at night or at dawn, temperatures can fall to 0 degrees to then go up to 20° during the day. For Italians, a passport valid for at least 30 days after the date of departure from the Country, with at least 2 blank pages. Tourist visas, for up to 90 days’ stay, are released directly upon arriving at the border. For stays over 90 days it is necessary to request your visa at a South African consulate/embassy. Currency and customs formalities: the import of local currency is limited to 5,000 Rand, while the importation of foreign currency is unlimited. An international driver’s licence is not obligatory for an Italian citizen, although it is recommended: it avoids wasting time at security checks (especially if you still have the old paper one). Hire companies often require it. The temporary import of your own vehicle deserves particular attention. Some South African websites indicate as ‘not necessary’ for European citizens to have the ATA Carnet for Temporary Admission of Goods (CPD)… but further research revealed instead that it is a fundamental document to have also in South Africa. Some tour operators take care of the request for a nominal fee (between 100 and 150 Euros) and often also of the necessary guarantees (through the insurance policy). For Italian citizens it is possible to find more information on the CPD at ACI (info for travelling abroad 06/491115; customs documents 06/49982444). Personal liability insurance must be undersigned locally for the duration of the motorbike tour. The Italian Embassy is in Pretoria 796, George Avenue 0083 Arcadia. Sanitary conditions are generally good. So is the level of private health services. There are no problems finding all major drugs on the market. Illnesses present: In rural areas of the Limpopo, Mpumalanga and northern KwalaZulu-Natal regions, periodic outbursts of cholera occur. If travelling in these areas (including the ‘Kruger National Park’, and the Wetlands region around Saint Lucia) it is advisable, after consulting with a doctor, to undergo effective anti-malaria prophylaxis. Hepatitis A and B, tetanus, pertussis, poliomielitis and measles are also present. Bilharziasis is present in rivers and freshwater lakes where it is advisable not to bathe. It is also to be remembered that South Africa is one of the Countries in the world where AIDS is most diffuse. Obligatory vaccinations: Vaccination against yellow fever is obligatory only for travellers coming from Countries where this illness is endemic, including transit over 12 hours in airports situated in Countries at risk. Warnings: Tap water and food do not generally present particular problems, especially in big cities and in facilities located near the major tourist areas. It is in any case advisable to keep high hygienic standards; eat only well cooked food and drink only bottled water and beverages, without adding ice especially in the rural areas of the Provinces of Limpopo, Mpumalanga and northern KwaZulu-Natal. It is advisable in any case to stipulate, before leaving, a medical insurance covering medical expenses and the possible medical repatriation. It is best for the insurance to include advanced payment in the case of hospitalisation. Private clinics, in fact, do not treat patients without advanced payment. In South Africa there are 11 official languages. Luckily English is among the most common ones. The local currency is the South African Rand (ZAR). International credit cards are accepted everywhere. Mobile networks are active all over the country. Electricity voltage 220V (3 round pins adaptor needed). Wi-Fi service available in major cities. The time zone is the same as Italy when Italy is on daylight saving time, and +1 hour for the rest of the year. Police emergency number: 10111. Ambulance emergency number: 10177. In South Africa there are no particular problems linked to finding fuel, it is relatively easy to find petrol stations, but it is always best to have some extra petrol, especially if travelling off-road. South Africa has a ‘Mediterranean’ climate, with mild winters (and springtime temperatures in some areas) and hot summers. The seasons are the opposite of Europe. Given the vastness of the territory, also the climate can change a lot. There is in fact no preferable season. A lot depends on the itinerary.